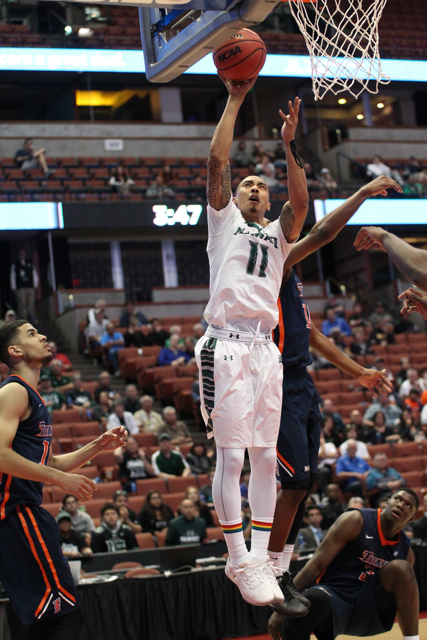 If it is true that defense wins championships, the University of Hawai’i basketball team showed on Thursday afternoon that it wants the top prize at the Big West Conference Tournament. The Warriors had their best statistical defensive game of the season in a 75-44 rout of Cal State Fullerton in a quarterfinal game at the Honda Center in Anaheim, Calif.
Hawai’i, which improved to 25-5 overall with its third win over the Titans this season, will face UC Santa Barbara in a semifinal game on Friday. It is scheduled to start at 4:30 p.m. (Hawai’i time), and will be televised on a delayed basis on ESPNU, starting around 9:00 p.m., but a live internet video stream will be available on www.espn3.com. The 44 points by Fullerton is the lowest total by a Hawai’i opponent this season, and the .298 field goal percentage by the Titans is also the lowest for an opponent this season. The Warriors also tallied 10 steals and eight blocked shots. In essence, Hawai’i proved its worth as the No. 1 seed against the No. 8 seed Titans. 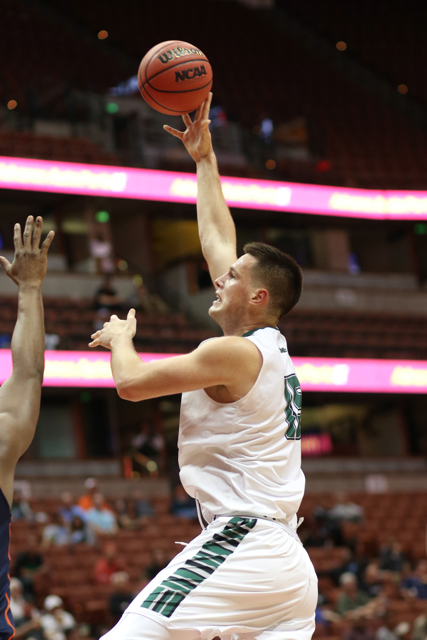 Junior forward Aaron Valdes led Hawai’i with 18 points on 7-of-10 shooting, and also contributed six rebounds, five assists and three steals. “We just started playing our game (in the second half) and that’s what helped us out there,” Valdes said. Senior point guard Roderick Bobbitt had 14 points, three assists and four steals – officially becoming the new UH career leader for steals with 163 (topping the previous mark of 160 set by the legendary Tom Henderson from 1972-74). Junior forward Mike Thomas recorded the first double-double of his career with 12 points and 12 rebounds. Junior center Stefan Jankovic had 12 points, four rebounds and three blocked shots while playing just 20 minutes due to foul trouble. Junior center Stefan Jovanovic played a key reserve role, contributing seven points and six rebounds, and sparking the second-half surge that put the Titans away. Ganot also noted that the Hawai’i post players stayed with the game plan on defense, helping limit Fullerton to 1 for 13 shooting from 3-point range. “I thought our bigs were tremendous in terms of taking care of those ball screens (defensively),” Ganot said. Smith also had the defensive play of the game – turning a breakaway layup attempt by Fullerton’s Lionheart Leslie into a two-handed blocked shot against the backboard. 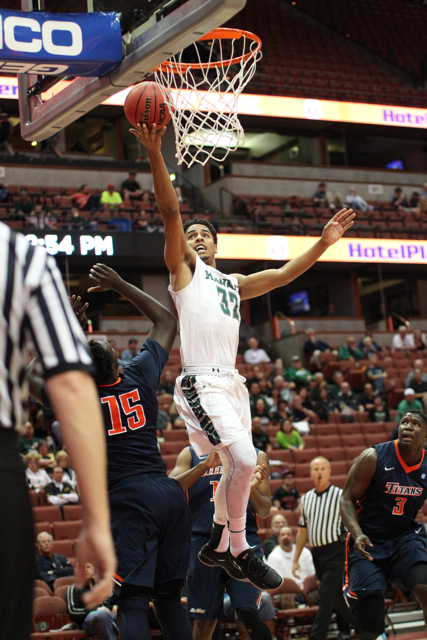 The Titans took momentary leads of 28-27 and 30-29 early in the second half, but Hawai’i out-scored Fullerton by a stunning margin of 46-14 over the game’s final 17 minutes. The breakaway by the Warriors came with Jankovic, the Big West Player of the Year, only able to play five minutes in the second half due to foul trouble. The Warriors took control for good with a 19-1 run that increased their lead to 57-33 with 10:06 remaining. The Titans never got closer than 20 the rest of the way, and Ganot was able to clear the bench for playing time in the closing minutes. 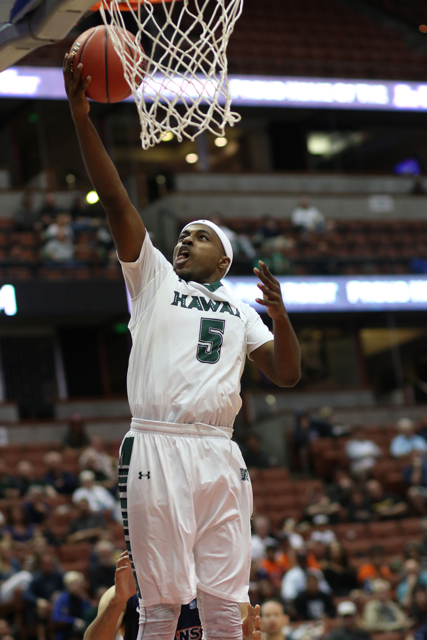 Hawai’i shot 46.9 percent from the field for the game, including 52.8 percent in the second half. The Warriors also out-rebounded the Titans, 49-34, and committed just nine turnovers while forcing 12. Fullerton finished its season with a 10-20 record, and made the Big West Tournament as a No. 8 seed only because CSUN was ineligible for the postseason. Akoh led the Titans with 12 points, and Tim Myles added 10 points and 12 rebounds. Now, the Warriors shift their focus on the No. 4 seed UCSB Gauchos, who are on a nine-game winning streak and scored an impressive 87-61 quarterfinal win over UC Davis on Thursday. UCSB is 18-12 overall, including two losses to Hawai’i, although the last meeting between the teams was back on February 4 in Honolulu. No. 2 seed UC Irvine and No. 3 Long Beach State will meet in the other semifinal game on Friday. No. 2 UC Irvine vs. No. 3 Long Beach State, 7:00 p.m. It will be a BATTLE tomorrow night…Got to bring it!! Going be the best? Play the best. Top 4 seeds in semis. I hope it is competitive. Why? Prepares warriors for deep run in NIT or NCAA dances. Oakland represent 808 and cheer loud .!! Heard might be 1000 hawaii fans in house! Go Bows!! Best D play of year in ncaa meb basketball my opinion! Bryson has been playing great for UCSB. Aaron will have a big defensive challenge tomorrow night. I think he’s up to it. As Coach Ganot says, defense and rebounding will make the difference. Nice highlights since i didn’t see the game. Dayton was on Sports Animals after the game with good comments,says he can’t be with the team on Sunday since he has to go back to his regular job on Monday. Congrats fellas!!! Also.. Please stay out of foul trouble! Feeling so excited and nervous. Listening to Santa Barbara fans yesterday talking, they’re feeling very confident. They like their chances , but also think Hawaii is very much like they are, very unselfish with ball and pass a lot. One fan noted “that gut Isaac killed us the first game and he’s gone”. I hope their team is this confident..OVER confident! I think that nine game win streak plays against them. Just talking out loud to convince myself and get the pre-game jitters out, HA! If you’re at the game, the crazy gray haired woman who sits half way up behind the bench and yells at the refs a lot is me. It’s very un-motherly but some guys sitting behind me yesterday called me the MVP fan yesterday, lol. My poor husband. Biggest game of the season is the game in front of you. This DEFINITELY the biggest game of the season, LET’S GO BOWS! For all of you who couldn’t make it to Anaheim, I gotcha! CALL IT BOTH WAYS, REF!!! WHERE’S THE FOUL?!! A big win. Stay focus. One game at a time. ROD Surpassed Olympian, First-Team ALL-AMERICAN NBA Champion TOM Henderson (HUGE Oakland! Hitting The Big Three On Her Birthday IS A Thrill! Good thing the top seeds passed the quarterfinals. It definitely looks better for the BWC as far as the NCAA sees it, and I want the best team to represent the conference in the big dance. Hawaii, LBSU, Santa Barbara, and Irvine could all do well. We swept UCSB in conference so we know we can beat them. As Gary Dickman said after the game yesterday, it might be hard for UH to beat UCSB a third time, but it’s equally as hard for UCSB to beat a team that’s beaten them twice. We can beat anyone if we play our best and if the officials aren’t bribed. Need a huge game from the Player of the Year. His back up bailed him out yesterday. Today’s prediction, UH 72, UCSB 68. Gauchos has been hot, but don’t sell our Warriors short. I believe in Coach Ganot and the team. In the other semi, Irvine will take down the Beach. No more Omaha!!!!! UCSB is a scary team but Hawaii should win today…the UCSB fans referring to Fleming beating them must have short term memory. We won AT UC-Santa Barbara by double digits (12) withOUT Isaac Fleming! Valdes wasn’t even fully healthy but still scorched them for 18 points. In review of the box score, we won the rebound battle (41 to 36) and held them to 41% FG’s and 27% from 3. We also won the turnover battle with 12 to 14. Like Ganot said, we just have to keep up the defensive intensity and rebound, plus take care of the ball and we’ll be fine. Team has that swag back. Starting 5 as good as any in nation.Jovanovich lot of exposure for future. No problem he starting center for many schools in. Country. Sheriff. Niko and Sai fill team first roles. Team carry on tradition of Great D Rainbow teams. I look for warriors getting to sweet sixteen maybe beyond? Why? Team first believe and execute. They can beat Duke. North Carolina . Utah in ncaa dance because they. The Warriors are playing like GS Warriors!! Wahine got the opening they were looking for. UC Riverside was upset earlier by UC Davis. Wahine is capable of beating Long Beach State, up 36-24 at halftime, and split with Davis in the regular season. Anyway, good chance. Has to just take care of business. Another regular season champion loses. Michigan beats Indiana on a 3 as the time expired. And UConn must be the luckiest team in all mankind. A 3/4 court shot, aka Stepden Curry with .2 seconds on the clock was answered and tied the game which sent it to a 4th overtime, which they won 104-97. Just unbelievable!!!! Team 1st, Lets win the Santa Barbara game first. I love your enthusiasm and get a kick reading your prediction of how far this team can go. We hopefully have 2 more games in Anaheim and should we be fortunate to prevail, only then we can talk about winning our first ever NCAA tournament game. I am focused on this game and I believe we will bring our A game tonight! Imua Warriors!! One in, one to go. 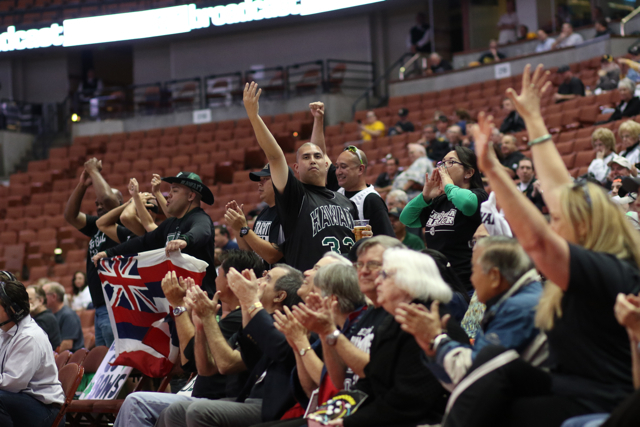 Wahine advance to championship game with 76-60 win over Long Beach. Marissa Wimbley 6-for-9 on 3-pointers for a career-high 18 points. How sweet it would be if both UH teams reach the final like last year, and both win it this time. How sweet it is! Wimbley was on fire. I feel for Riverside, they were down to only seven players due to injuries. Warrior fans packing the house at JT Schmid’s…we’re good for business! The Big West is lucky to have us. THEY should be paying for OUR flights, for crying out loud. Ok everybody, hands in the center: one, two three…TEAM!! Would sure be nice if somebody can hit at least 6 3s today. Tummala is capable, Bobbitt has done it earlier this season, Valdes can do it, and Jankovic can do it also. Q? Nah!!!!!! But, I like surprises! Go get it, guys: Defense, rebounding and … inside-out! With Q injured (hope is nothing serious) everyone has to give 200%. And Janks need to go for more shots or go for the rim instead of passing!!! Team first!! Warriors too athletic. Can defend and score. Might win by 25 over gauchos. A rout!on to the “ship”. Game over!! Bobbitt all great .defense!! Hawaii dream athletes make it dream job for Eran. Might be the deep ncaa run! Thanks team work off season hard!! Royal fans of their darling MBB TEAM are elated by the magical successes so far. These hard-earned wins are aided by the immense contributions from the ‘bench’. Even stronger supports are ask and, answered by our young men. May Lady Luck be with you always!